Favorite Sports Memory: Representing Canada at the 2008 Olympic Games. Such a great experience! 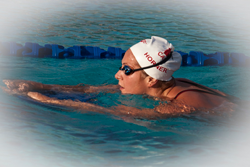 How you got involved in your sport: I started swimming as a summer swimmer at the age of nine. I loved my coach so much that I joined her winter group with the Beaconsfield Bluefins. The moment you knew you wanted to represent Canada: I really wanted to earn a spot on the National team so that I could start proudly wearing the bathing cap with a big maple leaf on it. I thought it was such a powerful statement. CAN Fund Testimonial: So thankful for CAN Fund’s financial support. As an athlete, you always struggle with working, swimming, and going to school all at the same time. It’s a huge weight off your shoulders knowing that people are there to help you through the journey. Best Result: Breaking the 200m freestyle Canadian record at the 2008 Games and being one spot away from making the final in the 400m freestyle. Share one valuable tool that you use on a daily basis that helps you to be the best athlete you can be. I try to make the best of everything rather than spend my time comparing myself to others. Who is one person in your life that has impacted your career and what was it that they taught you? My parents. They taught me to stay true to myself. Know yourself so that you can be the best that you can be, and then stop thinking and just do it. Fun Facts: My first language is French.